I am blessed to have some very generous readers. 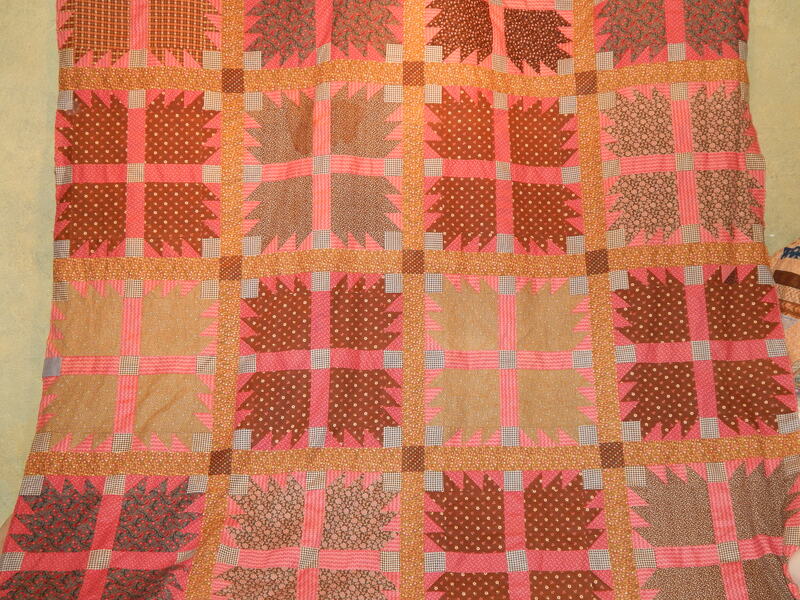 Hazel recently sent me a wonderful antique bear paw quilt top. She purchased the top for $5 at an auction house in Lynchburg VA about 1995. It had purple printed fabric and batting machine sewn on pillow case style on three sides. Hazel replaces a small amount of the pink and two large claws and a few of the black and white checks. I have to admit I can not tell which are the original and which are the replacements….she did a beautiful job! 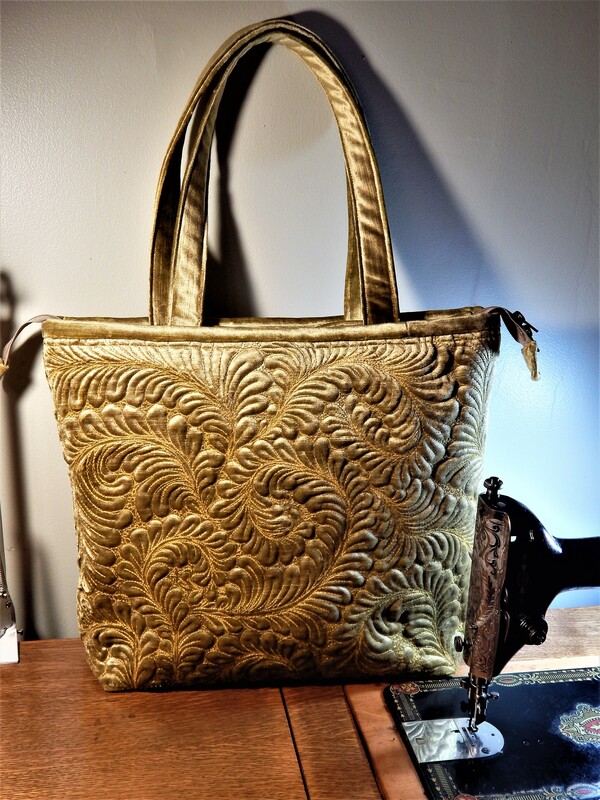 I will post more about this beauty when I start quilting. You really are on a lucky roll! That is a fantastic quilt! What a pretty top, and remember It is from the heart that treasure freely given is returned multiplied tenfold. 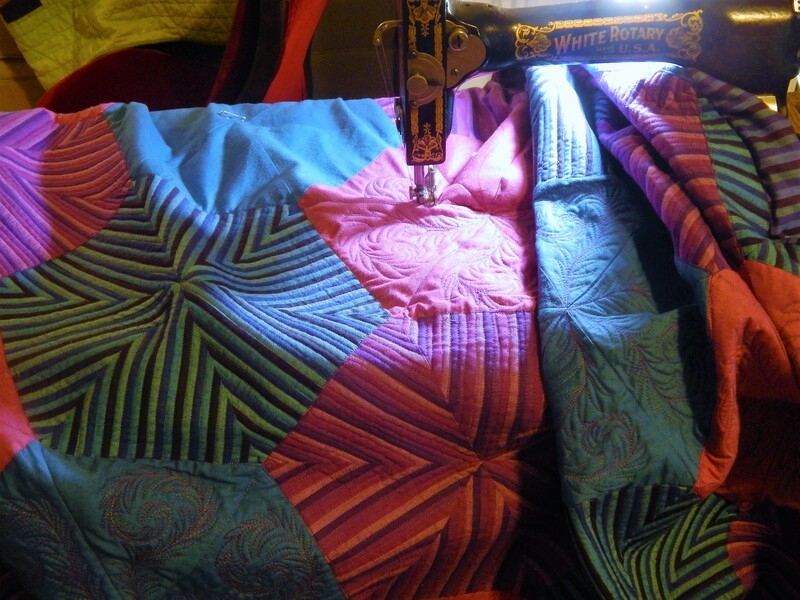 I started quilting a fan quilt about the same time you did and I only have three blocks done. I had to stop quilting for the last week. I think I have tendentious in my thumb, it’s very sore,I had just finished a quilt with big stitch, cotton batting and flannel backing. So my question is do you ever have sore hands from quilting. Maybe I’m not doing it correctly. 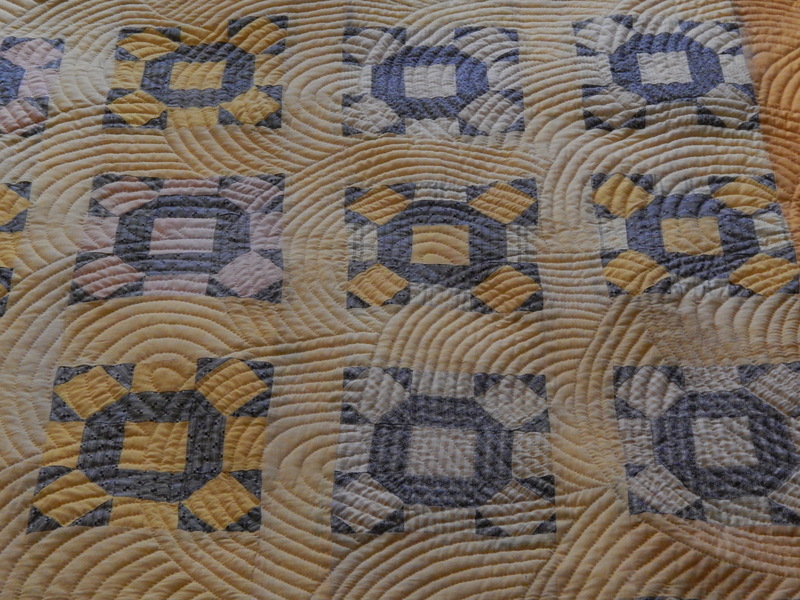 I love the colors in the bear paw quilt–what a generous gift. Like Teddy, I admire your fan quilting. the fabrics and colors are amazing! 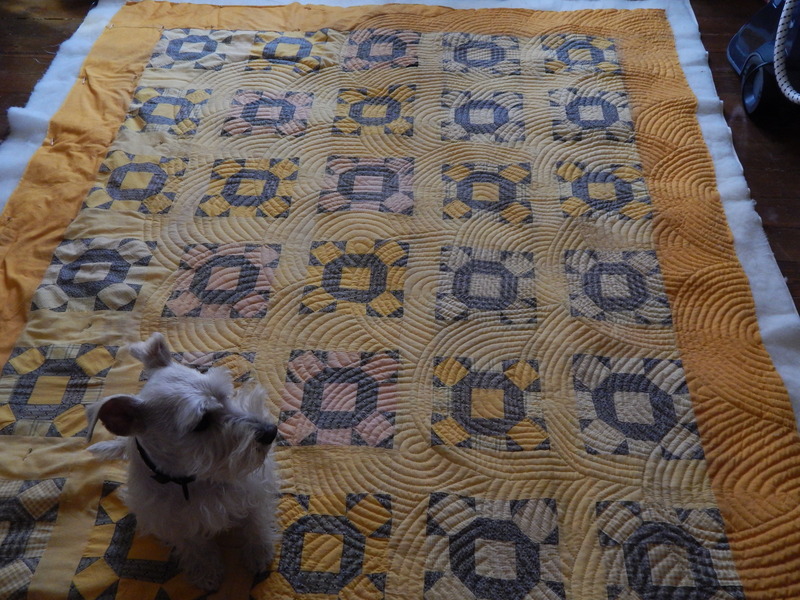 A big thank you to the quilter who sent you the top to quilt Tim it is a real treasure, such sweet sweet fabrics used through out it. Plus a big one to you for taking the time to finish all these lovely old treasures and been the custodian of them till some one else can treasure them. Cheers Glenda Australia. PS love the way you are quilting the latest one. That Bear Paw is very unique and will be so beautiful when you quilt it. You are lucky and Helen is a great friend to have. You sure have some generous followers, but I’m sure you already know that. It feels good to give someone something they will enhance with their talents. It sure is beautiful. 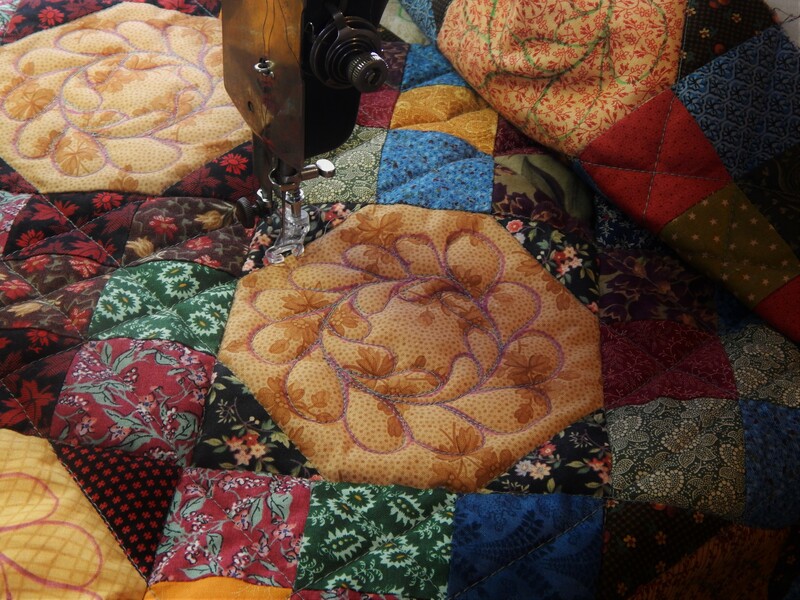 Would never have thought to quilt the large fans on that quilt top, but it is really looking wonderful! Your new quilt top is a beauty! Very generous gift! Kudos to Hazel, another smart heart who knew that the right home for this top was with Tim. Tim, when is that other quilt top that, em, showed up on your doorstop have its day in the sun? Let me know what you need otherwise. Wonderful quilt! Love the fabrics, great combo. I have an old quilt my grandma made with a church group on 1940. 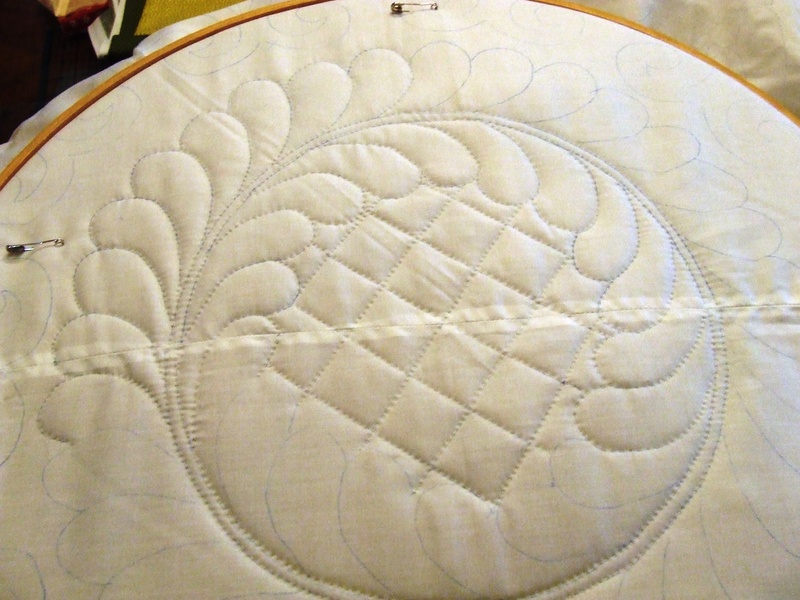 Would you look at it and tell me what should be done to repair, finish and quilt it? 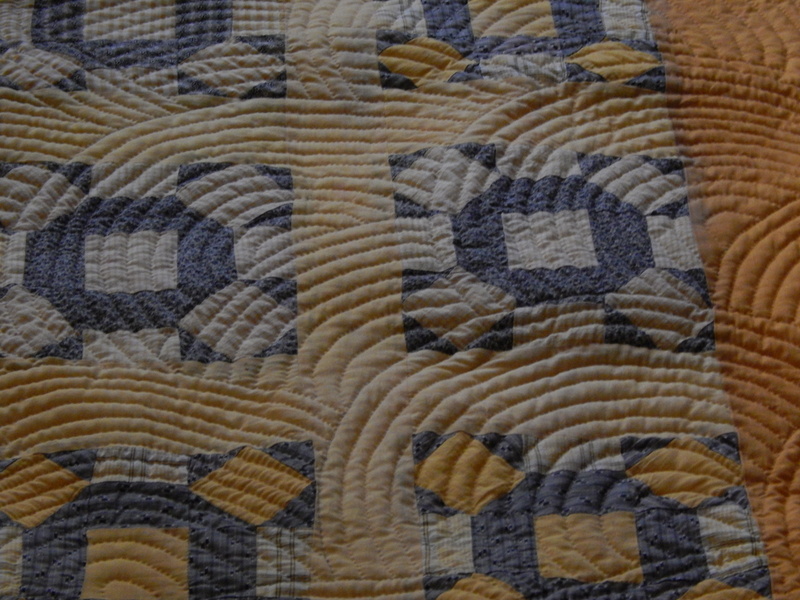 I love the curved quilting. Did you ever do concentric circles on a log cabin design? A group that I was with in NY did it on a log cabin and it was a real beauty. Oh, the dog adds a lot of visual interest to the photo. Handsome fellow.